Hello everyone!! This is Brenda Noelke from My PaperCut Creations. 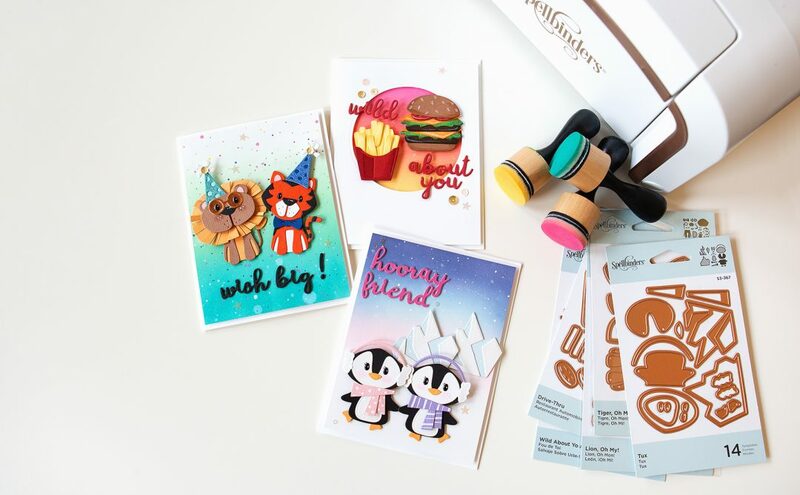 I am over-the-moon excited to be guest posting for Spellbinders over the next couple of weeks!! 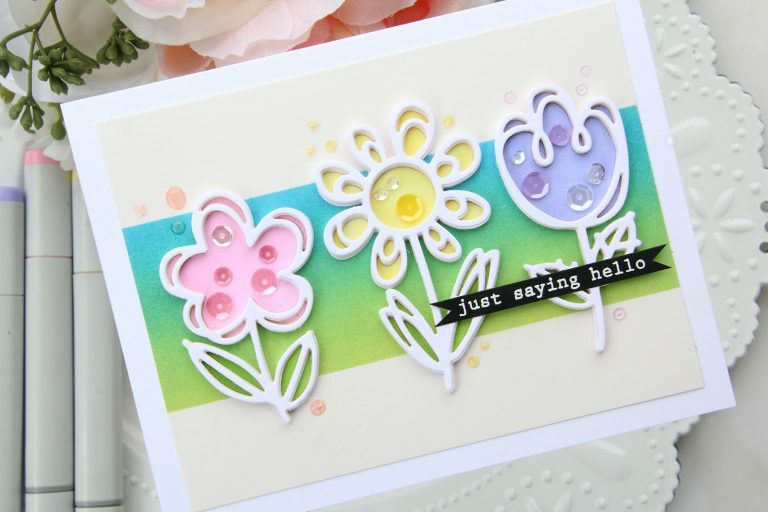 I will be using the fabulous February Die D-Lites Release. Seriously, something for everyone!! The project I have for you today uses the Sketched Blooms Dies. 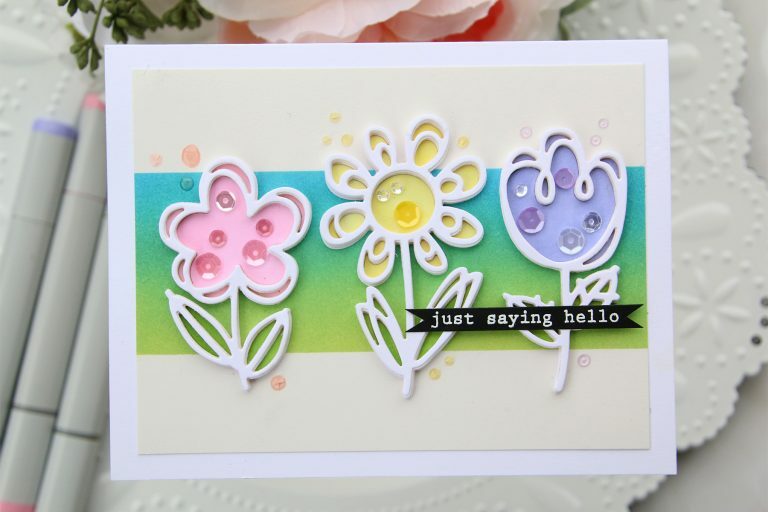 I usually gravitate toward floral stamps & dies. Here in the Midwest, we are anxiously awaiting the arrival of spring, so I definitely wanted to create something spring-like. I began by masking off the top & bottom of a panel of smooth cardstock and blended some Distress Oxide Inks for the background. I trimmed the panel down slightly and attached it to my card base. 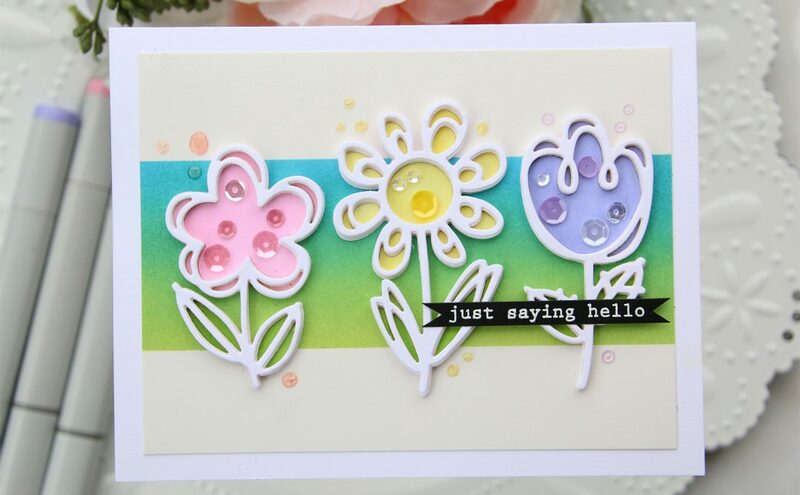 I LOVE dimension on my projects, so I cut each of the flowers from the Sketched Blooms Dies several times from thick, white cardstock. 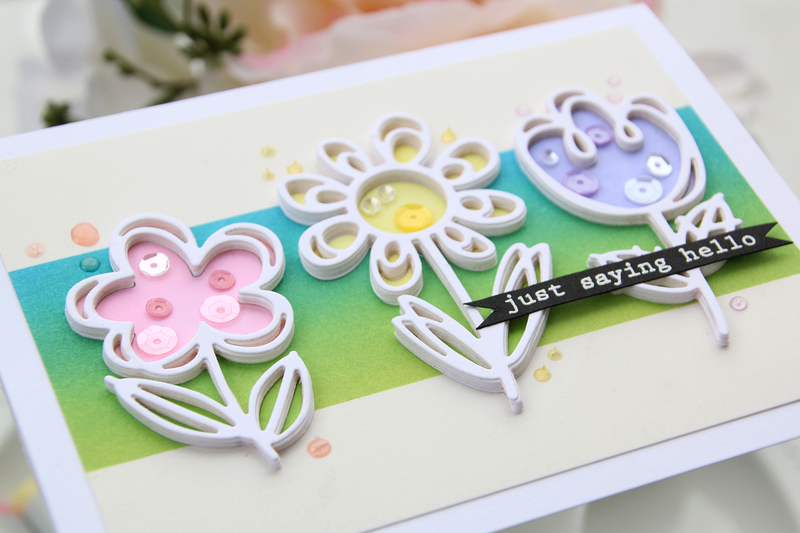 I adhered one of each floral outline die-cut to the card base over the ink blended background. I decided to color one set of the inner pieces from each flower with Copic markers and in-laid them into the outline die-cut. 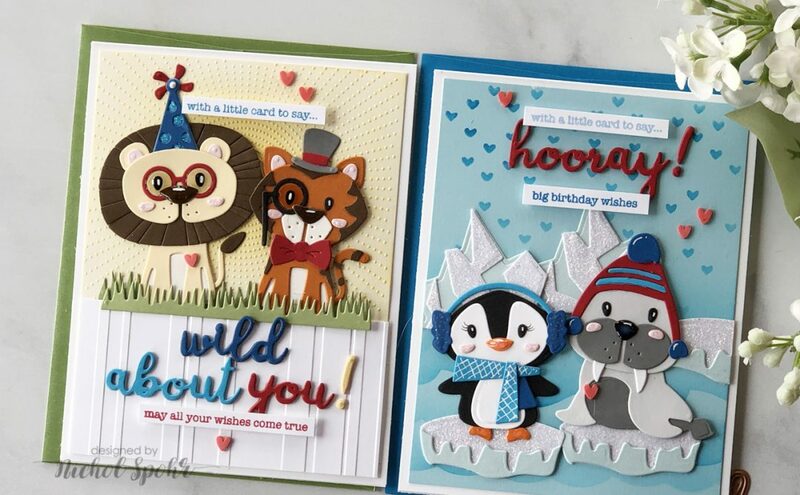 Next, I adhered the remaining outline die-cuts on top of each other and adhered them onto the coordinating die-cuts on the card base. 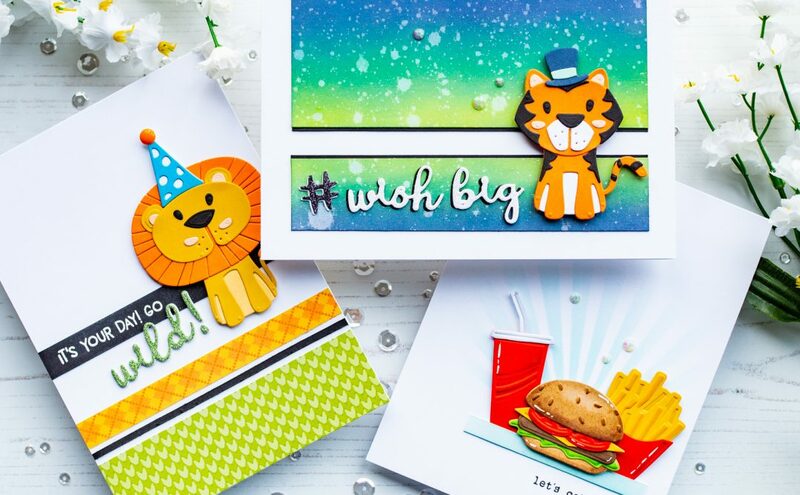 This creates so much dimension and really lets the die-cuts shine. The sentiment was white heat embossed onto a thin, black banner and adhered. Sequins were added to the center of each flower and a few jewel drops were placed onto the background panel. Neenah 110lb. cardstock; Bristol Smooth cardstock; black cardstock; Ranger Salty Ocean & Twisted Citron Distress Oxide Inks; Versamark Ink, Ranger Detail white embossing powder; The Ton Anemone Bouquet stamp set (sentiment); The Ton Sequins (Pink Diamond, Pink Bokeh, Belles Dress & Lilac Blossoms); Tonic Crystal Nuvo Drops (Rosewater, Limoncello & Pale Periwinkle). Thanks so much for joining me today!! I look forward to sharing more projects with you! Beautiful! 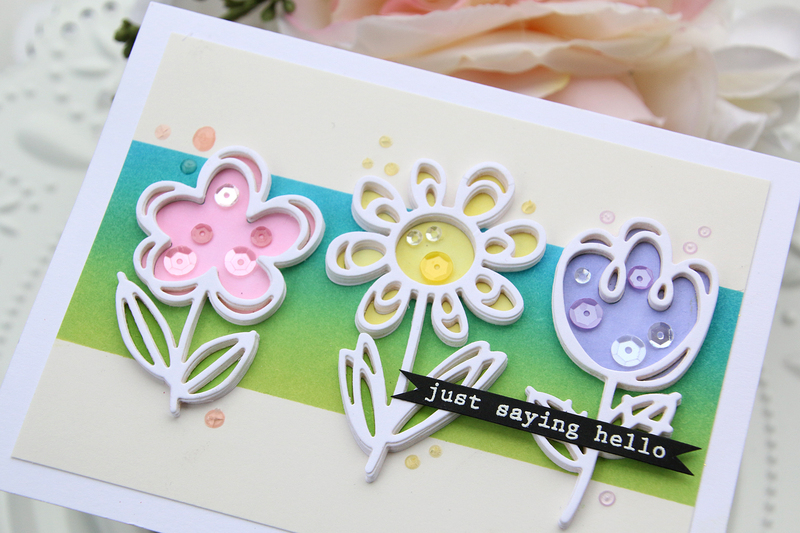 Lovely idea for these cheerful flower dies. Thank you so much for sharing. and love the die cut.